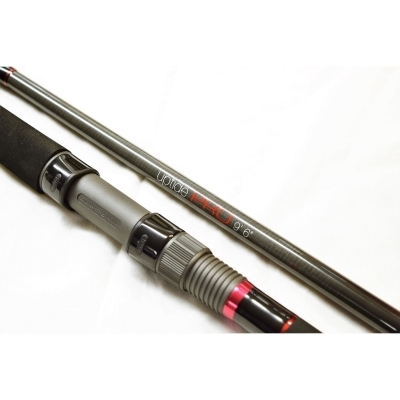 Anyfish Anywhere 2 Piece Red Label Uptide Pro Rod - 9ft 6in. The Anyfish Anywhere UptidePro has been developed to meet the needs of the modern boat angler fishing from either charter boats or your own boat. It has been extensively tested in the demanding waters of the Bristol Channel and proved more than a match to the strong tides and hard fighting tope, rays and hounds. The rod loads quickly allowing you to cast well away from the boat even if your boat position gives you a restricted casting arc. The slim tip gives the perfect balance between bite indication and resistance to tidal movement. Once a fish is hooked the mid-section comes into play giving you the feel and control to fight a fish to the boat. The bottom end has some serious grunt to help you drag a big blonde up against the tide. Finish is of the high standard you would expect and features Fuji guides, a screw winch and comfortable shaped handle. Red label rods are not not only Anyfish Anywhere's premium rod range, they are quite simply some of the very best beach fishing rods you can buy. Over the past eight years they have become the first choice rod for the large majority of the UK's top competition anglers who demand the very best in a series of rods, designed to be able to catch fish anywhere and in any conditions. The approach to rod design balances casting performance with fishing performance, giving each aspect of the design equal importance, so that the anglers that use red rods have THE very best balance between the two. At the end of the day, its all about catching fish, and the achievements of our rods over the past eight years, show just how good they really are.